Induction cooktops or ranges do not heat up like traditional electric or gas units. Instead, magnetic induction coils under the glass surface are engaged by electric power and create a magnetic energy field. The energy field causes the pan on the surface above the coil to get hot, and cook the contents of the pan. 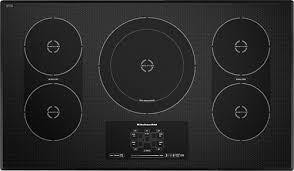 Nearly all of the major appliance companies have induction cooktops and/or ranges in their product lineup. Induction heats quickly and precisely with only a small amount of residual heat transferred back to the glass top. Other advantages of induction cooking include precise control of temperature and results as well as cooler kitchens, and easy cleaning. It’s very safe, since the cooking surface does not heat up like traditional cooktops. While traditional gas cooking has an efficiency ratio of 40%, and electric is 65%, the energy efficiency of induction is 90%. Induction is also very safe, since induction cooking surfaces do not heat up. There is a small amount of residual heat transferred from the pan back to the glass surface. Finally, induction is a safe and clean technology. Here is a brief cooking video from our sister company, FBS, demonstrating an induction cooktop from Bosch. What are the disadvantages of induction cooking? The disadvantages of induction cooking include the need for special cookware. Cooking vessels must be magnetic, meaning that they must be iron or steel based. Cookware made of aluminum, copper, or glass will not work. Stainless steel or cast iron pots and pans work great. Like most new appliance technology, the cost of induction cooktops and ranges is higher than traditional cooking modes. However, the cost has decreased over the years and is much more affordable. For example, Frigidaire offers a stainless steel range with induction that sells for under $1000. Most of the major brands have induction ranges or cooktops in their lineup. We’ll discuss some of the features and benefits of induction products in future blogs. In the meantime, the trained professionals at Arizona Wholesale will be happy to answer your questions about induction cooking.